or have helpful information for you. Pokémon Organized Play (POP) is an international organization that promotes good sportsmanship and enjoyment of the Pokémon Trading Card Game through competitive and casual play. Leagues and Prerelease events support a casual and fun gaming environment while preparing players for the challenges of our more competitive tournament series. That series of City Championships, State Championships, Regional Championships, National Championships, and Gym Challenges are meant to provide players opportunities to earn great prizes and hone their Pokémon TCG playing skills en route to the pinnacle event of the year, The Pokémon TCG World Championships. If you’d like to know more about Pokémon Organized Play, go ahead and check out the official website for more info. Pokémon Organized Play is supported by Pokémon USA, Inc, a subsidiary of The Pokémon Company. For more than 10 years, kids all over the world have been discovering the enchanting world of Pokémon. Today, the Pokémon family of products includes video games, the Pokémon Trading Card Game, the Pokémon animated TV series, movies, toys, and much more. Many parents feel that the Pokémon TCG and Pokémon video games encourage their children to learn to read, since reading is required in most Pokémon games. The games also encourage strategic thinking, and in many cases, basic math skills. Pokémon puts a strong emphasis on good sportsmanship and respect for other players. Click here to go to the Pokemon Website’s Parents’ Guide page for all the information you’ll need. Here’s a link to a section on Pokemon.com’s support page (click on the most popular topic on the page there) that helps to explain how to set up a Trainer Club Account for yourself or a child if you’re a parent. I also have a Trainer Club Info section on my website that has some additional details on setting up your account, especially if you had an old account. Having a Trainer Club Account is definitely something you’ll want to do… It helps to ensure you’ll get the Promo Items for the League, Play Points for tournaments, and also be able to check your rankings in the state, country, or even worldwide. You can also choose your own Trainer image, get special backgrounds and items, display your favorite Pokemon, play games, watch episodes… all kinds of fun things! So make sure you set up your Account today! The Pokegym is also the place to go for all of the latest in Pokemon news… their forums contain information on upcoming events, the buzz on the latest card gossip, strategies, trading, and of course official rulings for all your TCG questions. You’ll find me as PokeMama there in the PokeGym Forums! Feel free to say hi to me! This software was created to help make it much easier to correctly fill out tournament deck lists, helping avoid errors and costly penalties. It’s super easy to do, while at Pokegym, just click on the link for the Decklist Creator Page. Click on Blank Deck (Modified) and it will show the decklist with drop downs for each different section… Pokemon, Trainers, and Energies. You can enter your name, birthdate, Pokemon ID number, even pick a favorite Pokemon image! Then print it out and you’re ready to go! I highly recommend this one! Marriland.com is one of the fastest growing Pokemon websites on the web! Marriland.com has a Pokemon Black & White Pokedex complete with pictures and moves as well as a Pokemon HeartGold and SoulSilver Walkthrough, Black & White walkthroughs and guides, and a massive number of D&P, BW2, and X&Y videos made by Marriland. Marriland.com also has a complete Diamond and Pearl Walkthrough and Pokedex, complete Pokemon Trading Card Game Spoilers and Card Scans, Pokemon Wallpapers, and over 400 Pokemon Buddy Icons.With all of this information, Marriland.com is definitely the place you’ll want to be for everything Pokemon! The webmaster there is our very own Devin Peltier-Robson (and my son! ), also known as ‘Marriland’ and he’s been working on this site and fine tuning it for several years now. Go take a look! There’s so much information there, you’ll be amazed! The Marriland Forums are very large, active Forums, with a wide assortment of various topics to discuss. Although the Forums are mainly tailored to Pokemon fans, anyone will be able to enjoy them and the non-Pokemon related Forums inside, too! But these Forums are far beyond other Forums out there – we’re a great community and that’s what makes us different! There’s so much to do at the Marriland Forums and so many friendly people there, making it a great cure for a boring day! I’m an Admin there… of course I’m PokeMama there as well. 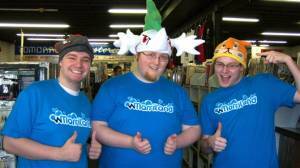 Founded in June 2011, The Top Cut is a group consisting of four players – Drew Holton, Josue “Crimz” Rojano, Kyle “Pooka” Sucevich, and Michael Pramawat – dedicated to promoting the growth of the Pokémon Trading Card Game. Having played for over 10 years each, all of us have a passion and love for the game we grew up with. Unfortunately, there is a major lack of online coverage when it comes to Pokémon; we are looking to change this. We plan on doing real-time updates from tournaments across the nation via Twitter (@topcutpokemon), interviews with top players, players who are doing well in the tournament, and many others. Finally, at the end of each day we will have a recap of the day’s events along with pictures. We are streaming a weekly talk show, playtesting sessions and games with commentary as well. Ultimately, we want anyone who is not at an event to be able to experience it and know exactly what is happening. Our goal in the end is to make the Pokémon TCG bigger, better, and more accessible to everyone. For those of you who are TOs or PTOs who would like to use any of the ‘stuff’ I use at my events, such as table tents, Color Me’s, Flyers, Activity Sheets… feel free! Here’s a link to my Resource Page for you so you can print them out.